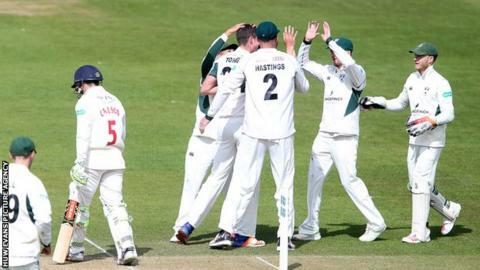 Teenage Worcestershire seamer Josh Tongue took 5-45 on his County Championship debut to help beat Glamorgan by eight wickets in Cardiff. Resuming on 141-3, Glamorgan collapsed to 223 all out, only Aneurin Donald (57) offering any real resistance. Openers Daryl Mitchell and Brett D'Oliveira fell cheaply, but Tom Fell's 15 not out saw the visitors to 28-2. Glamorgan were beaten in under two-and-a-half days, having failed to last two days in their opener with Northants. Six ft 5 in paceman Tongue, 19, was making only his second Worcestershire appearance, having taken four wickets in the match in his first-class debut against Oxford MCCU earlier in April. "It is frustrating to everybody. There is a group of players that are very disappointed. As support staff we are, and I am sure every supporter that followers Glamorgan is. "It is certainly not the start that we envisaged or imagine or hoped for, but it is where we find ourselves. The crucial thing is as a squad, and I include support staff and players in that, is we work our way out of it. And when we work our way out of it we remember how it feels so we don't go back here. "It is inevitable that confidence gets dented when you have got hurt badly in the first innings in Northampton and the same happened here. We've been very much behind the eight ball from the first session of the game." "I'm really proud of the boys. It was a terrific effort. The toss was important, and we soon had them in trouble in helpful conditions. "It was so good to see the young players such as Josh Tongue and Tom Kohler- Cadmore perform so well. It bodes well for the remainder of the summer. "There's more to come from Josh Tongue. He's certainly got some pace in him. We saw that when he hit Donald on the helmet. However, he still has two screws in his back, following a stress fracture, and it's very important that we do things right for him."